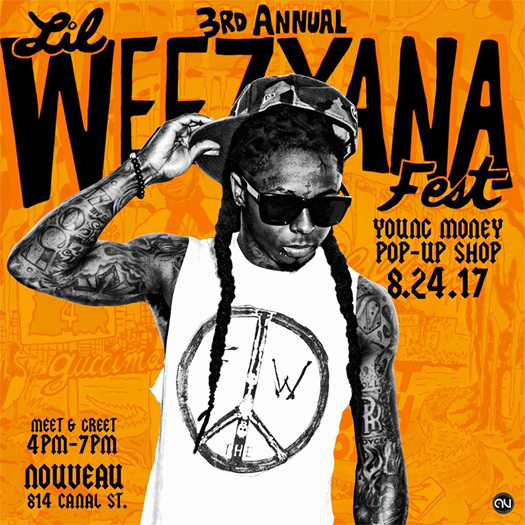 Tomorrow (August 24th), Lil Wayne will be hosting a Young Money merch pop-up shop at Nouveau clothing store in New Orleans, Louisiana. 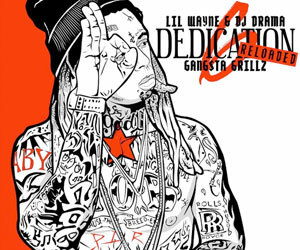 From 4PM to 7PM, you will be able to meet and greet Weezy and his Young Mula artists. Check out the flyer above for more details on the event. Click here to see a recap from the 2nd annual “Lil Weezyana Fest” pop-up shop and here to see a recap from the 1st annual “Lil Weezyana Fest” pop-up store! 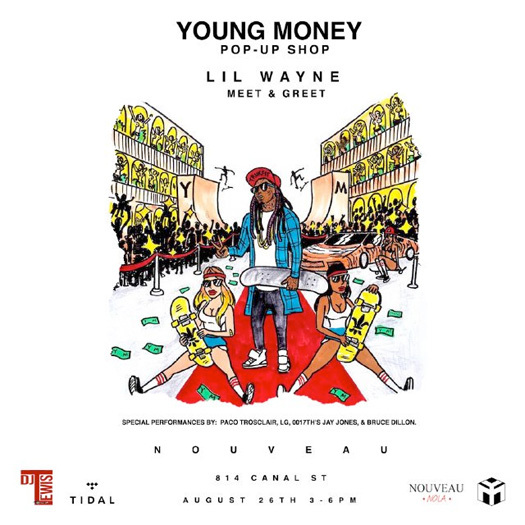 Tomorrow, Lil Wayne and his Young Money team are hosting a pop-up shop at Nouveau clothing store in New Orleans, Louisiana. If you want to meet Weezy and his Young Mula crew, get their autographs and have your picture taken with them, be sure to pull up to the event. In other news, Jay Z’s streaming service TIDAL have confirmed that they will be live streaming Tunechi‘s 2nd annual “Lil Weezyana Fest” on August 27th from 7:30PM CT, so if you can’t make it to New Orleans this Saturday, you will still be able to watch the concert online! Click here to check out a recap from last year’s YM pop-up store at Nouveau in N.O. that included appearances from Cory Gunz, Mack Maine, HoodyBaby, Lil Twist, Stephanie Acevedo, Gudda Gudda, Euro, Shanell, Jae Millz, N.O. Capo, YoYo, JaSoRude, Fee Banks, Turk, and more. 2 members from Lil Wayne‘s Young Money skateboarding crew, Jereme Knibbs and Tyreek “TJ” Morrison, recently spoke to VICE all about skateboarding with Wayne and what it’s like being signed to his team. 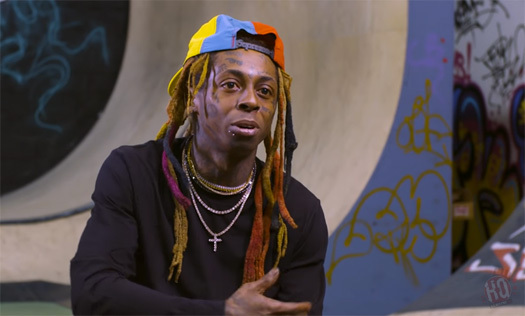 The skaters revealed how they first met Tunechi, how he has helped them, why they think they’re a liability, and more. 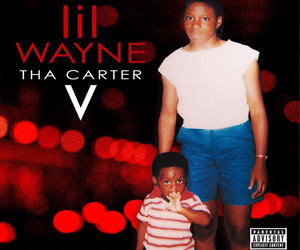 TJ also mentioned that if you think Tune skates a lot, he says he still spends more time in the studio, as well as that Tha Carter V is coming and “he has some heat”. You can read the full story after the jump below! 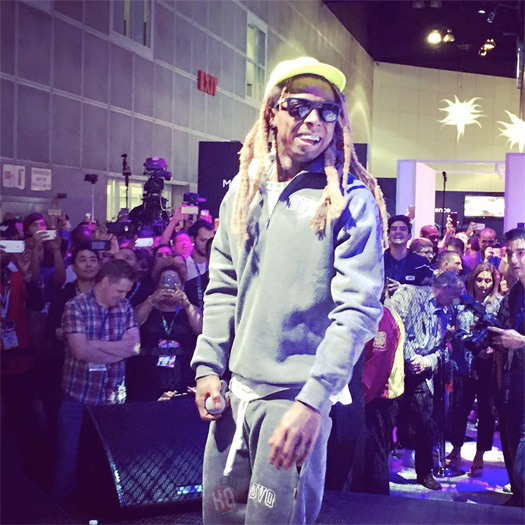 While making an appearance at the Los Angeles Convention Center for the 2016 E3 video game conference in California on June 15th to promote his “Sqvad Up” game, Lil Wayne also put on a show for everyone in attendance. Standing in front of a skate ramp that had his skater crew doing their tricks, Weezy performed “A Milli“, “John“, “I’m Goin’ In“, “Go DJ“, “Pop That“, “Loyal“, “Truffle Butter“, “The Motto“, and “No Worries” live. 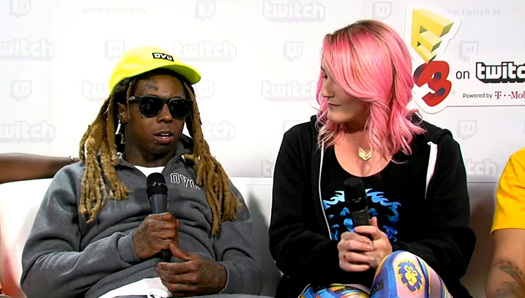 You can check out some footage of Tunechi‘s full performance at E3 in a video after the jump below!